Hugh Ellis found Voodoo for sale in San Diego whilst looking to step up into a big boat. She had been raced in the US as a predominantly downwind racer having recently completed the Transpac. They wanted to get her back in time for the Noakes Sydney Gold Coast Yacht Race but the shipping schedules from the U.S. didn’t align. The crew put their hands up and she was sailed back from the US via Tahiti and Fiji. The delivery was a good way to sort out any bugs and once back in Australia did a lot of work including stripping and rebuilding the mast and rigging. North Sails have worked closely, and the team are very happy with the sail set up. “All the guys are really invested in the program and we’ve all enjoyed the journey. There is a lot of experience on the boat and we are learning more every time we go out. 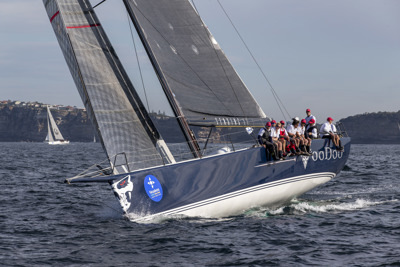 A ‘typical’ Hobart with some heavy upwind work would suit Voodoo. Hoping for a quick trip,” said owner/skipper Hugh Ellis.